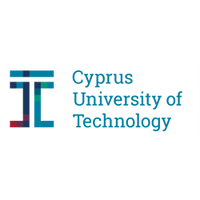 Profile: Cyprus University of Technology (CUT) was established by law in 2004 and with its orientation towards applied research, the University aspires to establish for itself a role in support of the state and society in their efforts to confront problems, which cover all areas of science and technology. CUT’s involvement in research has been recognized from the fact that within the last four years, more than 10M Euros projects have been funded. CUT has as its strategic target the design and development of research activities both within the University and in cooperation with other research Institutes in Cyprus and abroad. The research emphasis of CUT is reflected in the substantial funding provided to academics for the establishment of research centres and laboratories (for example: the Social Computing Research Centre, The Cyprus Interaction Lab, The Statistical Machine Learning Laboratory, The Visual Media Computing and Microsoft Computer Games and Emerging Technologies and The Network Systems and Science Laboratory members of which are part of this proposal). In this project, CUT participates through its Social Computing Research Center (SCRC) (http://www.socialcomputing.eu/), a multidisciplinary center aiming to advance research on various aspects of Social Computing. The Centre addresses the key societal challenges outlined in Horizon 2020, the Common Framework for Research and Innovation (2014-2020) which among others include: (a) inclusive, innovative and secure societies (including cyber-security); (b) information and communication technologies; (c) alignment of society (including societal actors such as researchers, citizens, policy makers, business, third sector organizations etc.) with research and innovation process; (d) seizing the ICT opportunities for engaging society more in its research and innovation activities. SCRC focuses on the intersection of Computing and Social Sciences addressing key societal challenges. This research unit’s topic is novel and unique, both in Cyprus and internationally. Although the topic of social computing is being investigated by other groups in Cyprus and internationally, this is often done mono-thematically within one department or rarely as a collaboration between two universities or two departments. In our case, the issues are studied in a holistic way involving researchers from various CUT departments and with various backgrounds (e.g., ICT, psychology, sociology, humanities, communication theory, etc.). SCRC faculty members have participated in the past and coordinated numerous (particularly 28) innovative national and international research projects (either as PIs or Co-PIs), whose themes have been directly related to the research activities of SCRC. Furthermore, SCRC’s team members have a long history of success in publishing results in the highest impact factor multidisciplinary journals, such as Nature and Nature Communications. SCRC is currently coordinating two HORIZON 2020 projects: (a)NOTRE (http://notre.socialcomputing.eu/); and (b)ENCASE (http://encase.socialcomputing.eu/). More importantly, the Network Science and Systems Laboratory, the Cyprus Interaction Lab and the Statistical Machine Learning Laboratory that are under the umbrella of SCRC will assist in the design and development of CONCORDIA. Expertise and Role in CONCORDIA: CUT participates in CONCORDIA through its Social Computing Research Center (SCRC), contributing in all WPs and leading T1.5 on user centric security. It will contribute in various research topics including Device-centric Access Control, identity acquisition, verification, and management, social trust, self-organized systems (e.g., social, Internet, and brain networks) machine learning, Large scale Data Processing Systems, Centralized and Distributed Database Systems, Cloud Computing. etc. Furthermore CUT will provide ample office and laboratory space as needed.